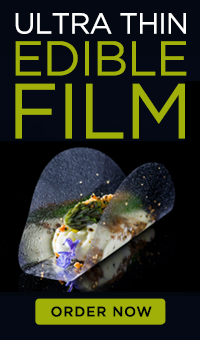 If you like dipping crispy bread in runny egg yolk you are going to love this molecular gastronomy dish. 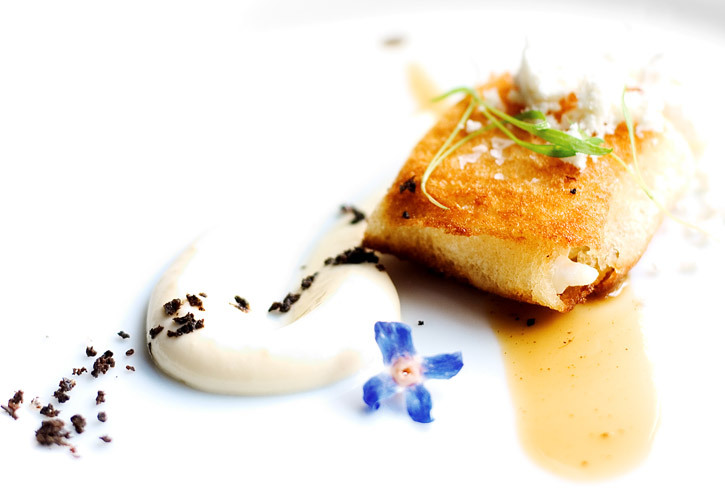 ”Egg, Bread, Truffle” is a creation of molecular gastronomy Chef Digilio of La Vineria de Gualterio Bolivar in Buenos Aires. Chef Digilio prepared this dish in front of our camera so we could capture all the details! The “Egg, Bread, Truffle” is a runny egg yolk wrapped in “pan de miga” (thinly sliced Pullman loaf, also called pain de mie), with a cream of fresh goat cheese, chicken wing pan sauce and truffle oil powder. Really delicious and one of my favorite dishes at La Vineria de Gualterio Bolivar. If you are not familiar with “pan de miga”, it is a very thin slice of crustless bread used in Argentina to make sandwiches, wraps, canapés and pinwheels. For this dish, it is better if it is really thin – about 5 mm. They are usually sold in large squares of about 10 in by 10 in or larger. You can probably find it in any Argentinean bakery or you can try making it yourself (pain de mie recipe) but it may be difficult to cut so thin without the appropriate bread slicing machine (try freezing it before cutting). 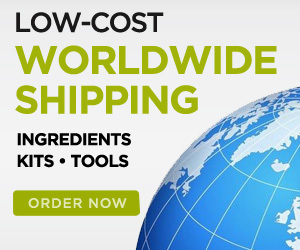 I also found this manufacturer in the US that sells it: www.slimandsoft.com . 1- Heat milk to 60 °C (140 °F), add goat cheese and whisk until smooth. 2- Remove from heat and add cream. Stir. 3- Season with salt and pepper. 1- Place the chicken wings in a tray in the oven at 180 °C (350 °F) until dark golden brown. 2- Add water until you cover the golden chicken wings and leave them in the oven to deglaze the pan. 3- Let the water reduce and then add more water. Repeat this process 2 more times. 3- Pass the chicken wing juice through a fine sieve and reserve. 1- Whisk together the olive oil and Maltodextrin in a bowl until it converts to a powder. To make it fluffier pass it through a tamis and reserve in a sealed container until needed. 1- In a large pot heat water with vinegar at 75 °C (167 °F). 2- Cook the egg yolks one by one for just 1 min. Remove the egg yolks carefully without breaking them and place them in a cool water bath to stop the cooking process. 3- Place two rectangular slices of bread crosswise on working surface. Using a steel spatula, carefully place an egg yolk on the center and season with salt. 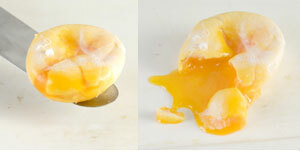 4- Fold the bread slices on top of the egg yolk to cover it completely. Cut any bread excess if the bread slices are too long. 5- Flip the wrapped egg yolk so the bread ends are at the bottom. Repeat for each egg yolk. Store in a container in the fridge until serving time. 1- Pour some olive oil in a frying pan and heat it. 2- Once the oil is hot, quickly sear each wrapped egg yolk on both sides. Sear one wrapped egg yolk at a time. 3- Place a spoon of goat cheese cream on the plate. 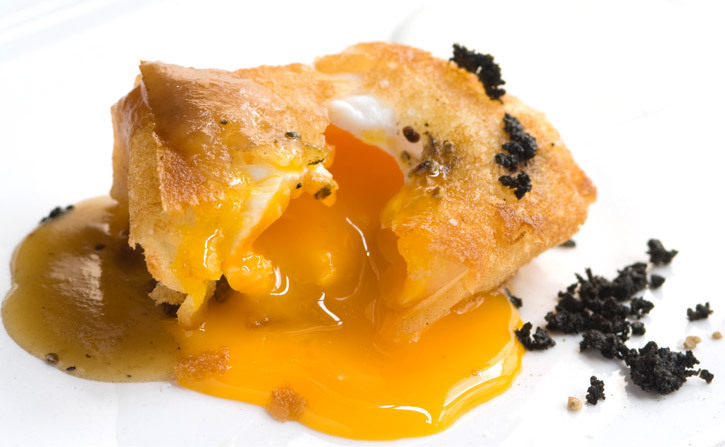 4- Place the seared egg yolk on one end of the cream. 5- Pour a spoon of chicken wing sauce on one end of the wrapped egg yolk.